Today was the Omaha Fashion Week Applicant Pitch Session and Showcase where all the designers involved came to show off their progress for the Fall event. 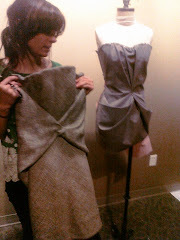 I was not able to be physically present since I am in San Francisco working on a textile collaboration project. However I sent them a packet of my work for the event so that I could also be assessed and receive feedback. The goal of the showcase is to place designers in the shows throughout the week and to select the designers for the finale show on Saturday, September 18th. Here is a peek at what I have been working on for the September 2010 event. I can't show you everything, but I am hoping that by sharing some of my progress it will help build suspense and excitement for the event!